Checking my Achievements today, I noticed I have 754 of 1,054. So just 300 to go. 107 in PvP and 176 in Dungeons and Raids. Some of the PvP I can work on as I've been slacking in that area, but unfortunately, the Dungeons and Raids achievements will take much longer to complete. One of our guild 10 man raids recently completed Glory of the Ulduar Raider (10 player) which makes me really jealous! I'm so close with just Vezax and Yogg to go. Hopefully when the new year comes, our 10 man will be able to take those two down. I'm also hopeful that before Cataclysm comes out I can get to 9,000 achievement points. I'm getting there and I think that PvP will be a big portion of any advancement towards 9,000 points. 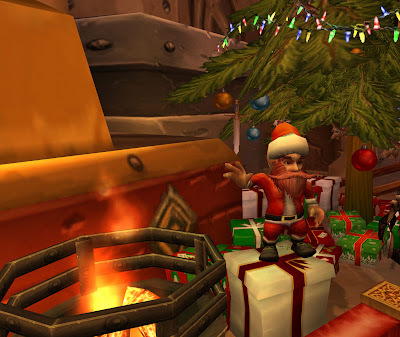 I still have a lot of achievements to go in almost all the battlegrounds, so I'm going to try and put in a couple of hours each weekend in PvP in the holiday battleground. As long as I focus on getting achievements, I should be able to knock off a few each weekend. Last night, during our run of Icecrown Citadel, I was able to raise my reputation with the Ashen Verdict to friendly. I unfortunately haven't been on any rep runs in Icecrown, so I'll slowly make my way to exalted as we run the 10 mans over these holiday weeks and the 25 man come next year. But with my new friendly reputation, I was able to pick up the Ashen Band of Destruction. A very nice upgrade over the Band of the Invoker. However, now I'm starting to run into a problem - too much hit. The new rep rings have an insane amount of hit, and prior to picking it up, I was able to get right to the hit cap through gemming. Now, all my gems have been optimized for the insane amount of hit on the T9.25 gear and this new ring - which puts me at almost 800 haste. And boy is it fun. 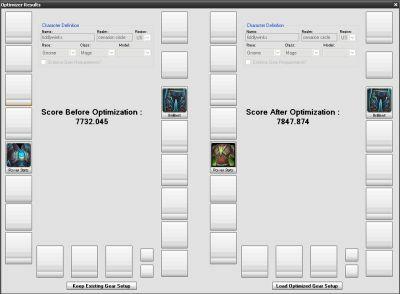 When I get an Icy Veins + Heroism going, those arcane blasts are under 1.1 seconds and the arcane missiles complete in about the same amount of time. With both buffs, I can now put out 9500 to 10000 DPS for a short burst period, and man, it's awesome. But back to the rings - I believe with the upgraded hit on the rings, as HokieBeeJay pointed out in a recent comment, the next best item for me to aim for is the T9 Bloodmage Robe. I'm getting closer as I am getting the weekly raid quest in each week and I haven't missed a daily heroic. Unfortunately, ICC(10) bugged for us the first week, so I'm 8 behind there and we haven't run any 25 mans yet...but I'm getting closer to 95 Emblems of Frost. I then have to continue to aggressively farm for gold as I'll need to get the Sandals of Consecration next. 5 primordial saronite at 2000 - 2500g is way out of my league right now as I only have about 5000g. But I can get there with some more aggressive farming and doing a few more dailies each day (I do about 8-10 dailies a day when I have time). But I'll get there at some point, and hopefully prices on primordial saronite will come down to a more reasonable level. If you're like me, when 3.3 hit, you upgraded Rawr and started looking for ways to maximize your raid utility and at the same time, look for new and exciting gear upgrades. But now you can assign item costs to gear and easily see how to best use your shiny new Emblems of Frost you've been running all those PUGs for. For this quick guide, I'll assume you know how to use Rawr and you already have it set up with your character imported, all gear setup, and all relevant buffs properly set. 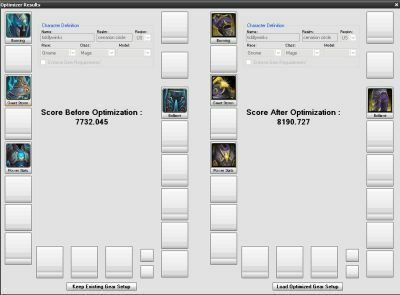 So the first thing you need to do is head over to Wowhead, search for Emblem of Frost, apply a filter, and then add a weight scale for your mage - see here. This shows you all the items you can buy with Emblems of Frost that are best suited for your mage. For some reason, this list doesn't currently have the Tier 10 items in there, so we will need to add those as well to our item costs - gloves & shoulders - 60 emblems; hood, robe & leggings - 95 emblems. So now there's two ways to use the new item cost editor. 1) Put in all Emblem of Frost items with an "item cost" of 1. 2) Put in all Emblem of Frost items with an "item cost" of the number of emblems it takes. The advantage of putting all item costs in at 1 is that you can see the single best upgrade with Emblems of Frost - regardless of cost. 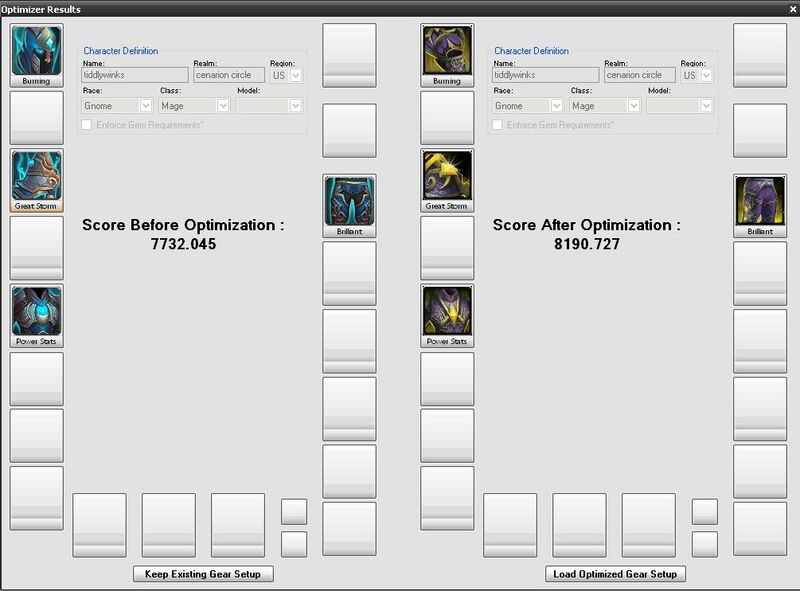 However, if you put in the item cost as the number of emblems each item costs, you can then optimize later for exactly how many emblems you actually have. I prefer the item cost of 1, so that's what I'll show in this guide. 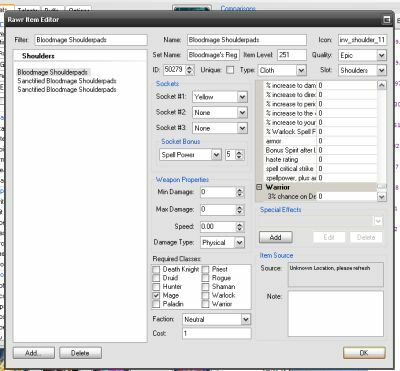 So to edit the item costs, pull up the list of the gear slot you want to look at - in this example, shoulders. 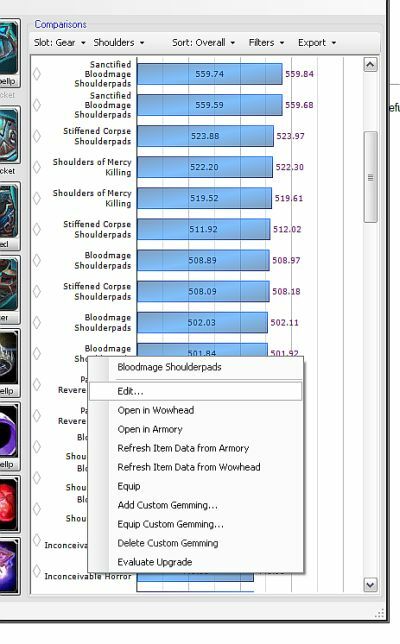 Go down to the item that you want to edit - for example, Bloodmage Shoulderpads. Right click on the item and select "Edit..."
Now just rinse and repeat this for all the items you want to evaluate. So now that you've got all these item costs in, what can you do with them? The easiest thing to do is just see which one item gives you the most bang for your buck (or badge). 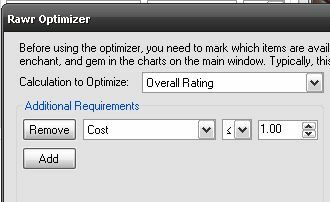 Go to Tools > Optimize and you'll see an option over on the left called "Additional Requirements." Click "Add" and select "Cost <= 1.00". What the optimizer has done for me is, with just one item from Emblems of Frost, my best upgrade is the Meteor Chaser's Raiment. 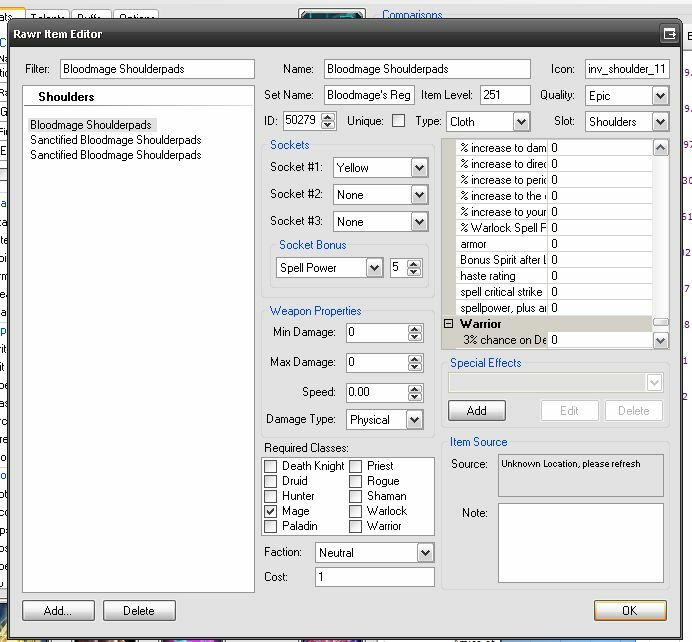 It shows my pants in this option because I need to change one +hit gem out for +haste for my otpimal gear setup. This leaves us with a quandary. We know that four pieces of Tier 10 is absolutely amazing these days. So what do we do? The Meteor Chaser's Robe is absolutely amazing, but is it a big enough upgrade over Merlin's Robe? Similarly, right now the Belt of Omission/Circle of Ossus is the best in slot (depending on hit/haste options). So do I aim for that along with the Robe? Short-term, the answer is yes. Those two upgrades will cost 155 Emblems of Frost. To get four pieces of Tier 10, you will need 345 emblems. With the length of time between unlock periods on Icecrown Citadel and gaining 14 emblems a week with the weekly raid/daily heroic quests, 345 really isn't unobtainable. So that's the way I'm going - saving for Tier 10. 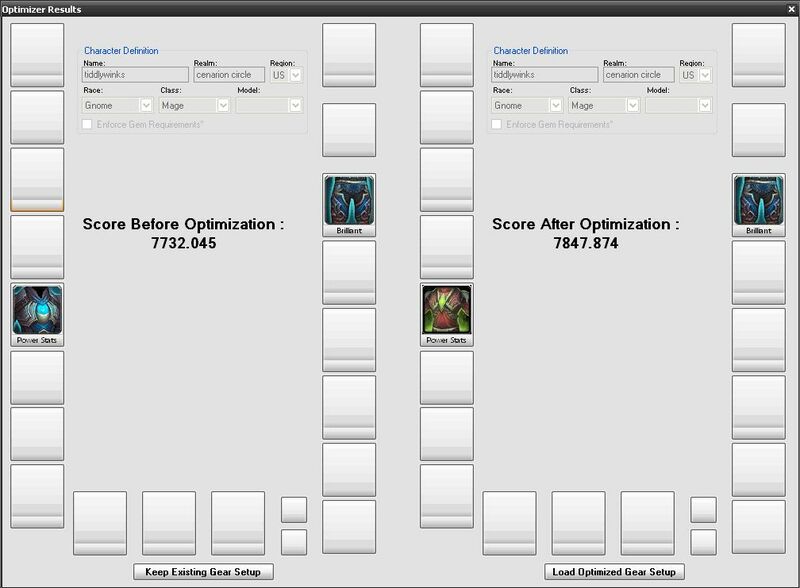 One thing you must always remember - Rawr is strange when it comes to optimizations at time. Just always run it a few times - and if you have the time, run it with the max thoroughness. I've run it a few times, gotten different results a couple of times, but now with max thoroughness, it settles on four pieces of tier 10, so that's the way I'm going. So it shall be.